"I think paranormal experiences are very personal, again, if they are that. Yes, sometimes I've felt that some things I would personally believe enough for me to take action on it... like, you know, I felt something happen in a hotel once that made me never stay there again." 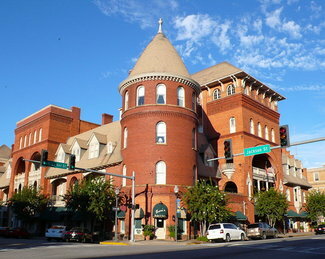 The Windsor Hotel is one of the most popular haunted places in Georgia. Nestled on a corner of a busy intersection in Americus, Georgia, this haunted hotel has proven to be an establishment that plays host to a number of spiritual beings. In the year of 1892, this establishment was constructed in a Victorian appeal and large enough to fill almost the whole block! This haunted hotel is one of the most appealing of all the haunted places in Georgia. Part of the attraction is the castle like image that it takes on, some is the inner beauty. In the case of spiritual inhabitants, it is so beautiful that they never wanted to leave, and remain there to this day! Here, you will learn about the Windsor Hotel in Americus, Georgia. 1. It is believed that a maid and her daughter that lived at the Windsor Hotel still reside at this haunted hotel. This family was murdered in the early part of the 1900’s. Many guests to this hotel have claimed to have seen the little girl, heard her laughing, and even running up and down the halls like she was playing. It is believed that this is ghost of the maid’s daughter. 2. There are hauntings that are associated with the maid, too! Many have said that they have seen a reflection in a mirror that is on the third floor only to look again and see nothing. It is not uncommon for kitchen tools, pots, and pans to appear to be tossed in a violent way. Electrical appliances, such as radios, have turned on and off regularly. These experiences are just a couple of reasons why this is considered to be one of the most haunted places in Georgia. 3. There was a man in the history of the Windsor Hotel in Americus, Georgia that was once an employee. This man was well liked and befriended everyone he came in contact with. 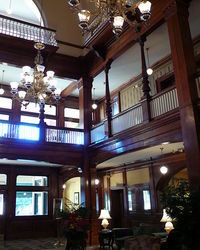 Many have claimed to have seen the friendly Floyd Lowery while staying at this haunted hotel. He generally appears to be happy, and does not cause any harm to the guests. As a matter of facts, most regular guests end up accepting him easily. While there are a number of strange happenings in the ever-popular Windsor Hotel in Americus, Georgia, the above are the most common haunts of the establishment. To date, this hotel is still in operation for visitors, ghost hunters, and simple tours. If you are interested in pursuing your own paranormal investigation, check for the lowest price, get directions, view photos, and read the reviews and traveler tips for the Windsor Hotel. What are you waiting for? One of the most haunted places in Georgia is awaiting your arrival!